Cast iron skillets are kind of kitchen superheroes. You can use them for cakes, nachos, chickens and more. Needless to say, ours is on heavy rotation. The only tricky thing is cleaning it. Here, a cool way to clean and season it that’s easy and uses stuff you’ve probably got on hand. What you need: Coarse salt, oil and a potato. What you do: Preheat the oven to 400 degrees. Sprinkle a generous amount of salt into the skillet. Cut the potato in half so that it fits in the palm of your hand. 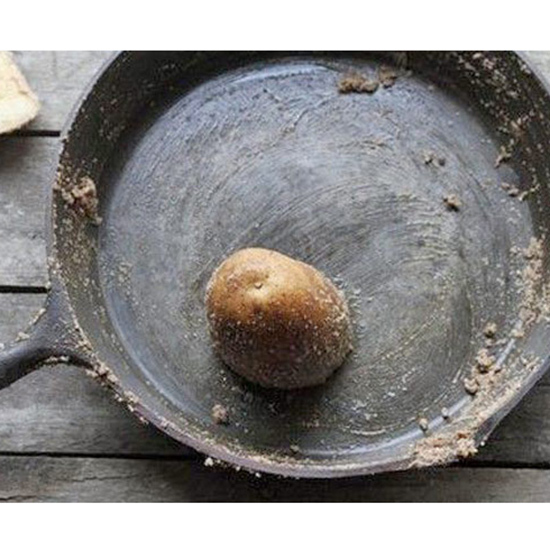 Place the spud, flat side down, onto the pan and scrub, pretty vigorously, in a circular motion. Once the pan is clean, rinse with water and pat dry. Almost there: To season, pour a small amount of oil into the skillet and spread evenly with a paper towel so that the whole thing is covered in a thin layer. Place the skillet in the preheated oven for one hour. Remove from the oven, wipe off any excess oil and you’re ready to go. Because nothing should get in between you and a massive chocolate-chip cookie.